The Homer L. Wise Memorial, Inc at the Mayor's office in Stamford. 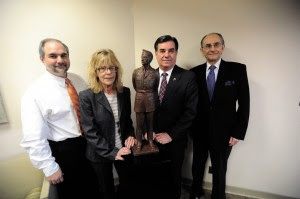 From left, Tony Pavia, Jean Rinaldi, Homer's niece, Stamford Mayor Michael Pavia and James S. Vlasto Secretary Treasurer and Project Director, with three foot replica of the statue which is now nearing completion at its full length of six feet three inches. STAMFORD -- Most Stamford residents have driven by Homer L. Wise Park hundreds of times -- and maybe even stopped to sit in the park -- but most people probably have no idea what a great hero Wise really was, said a member of the committee raising funds to erect a memorial statue in honor of the former U.S. Army sergeant. "Homer L. Wise was a very special soldier who served in W.W.II," said James Vlasto, project director, secretary and treasurer of the Homer L. Wise Memorial Committee. "He was awarded the Congressional Medal of Honor, The Silver Star, The Bronze Star, a total of 16 awards. He was a real-life hero who received astounding recognition and no one knows about it." In the spring of 2008, Vlasto created the Homer L. Wise Memorial Committee to build a life-size statue of the former Stamford resident, complete with a plaque to tell the community about the World War II veteran and his accomplishments. 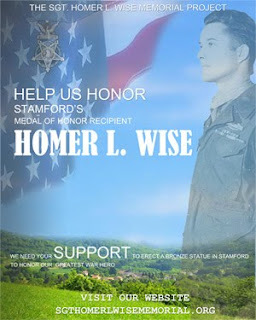 Currently, Homer L. Wise Park, which is located off Bedford Street in Stamford, only has a sign with Wise's name on it and a small plaque that states he won the Congressional Medal of Honor, he said. "In 1976, when the park was dedicated to Wise, that small dedication was probably OK," said Vlasto, "but I think that people need to know what a great man he was." Tony Pavia, who is also a member of the committee, said the most important thing about Wise -- who passed away in 1974 -- is that he was a very humble man, and hardly ever spoke about the awards he received. "Homer L. Wise is the everyday day man who rose to extraordinary heights to become a hero," said Tony Pavia. "His own son didn't even know that he won the Medal of Honor until he was 12 years old. If you look at the statue, it doesn't depict a king it depicts a common soldier, which is what Wise symbolized." Mayor Michael Pavia, who is also a member of the committee, said it is important to recognize Wise as a community hero, and celebrate his life and achievements. "Homer L. Wise is a compelling story," said Michael Pavia. "He was a common, humble man that rose to the occasion when he had to, and deserved the recognition that he received during World War II. There are many war hero stories, and we have one right here in Stamford." Vlasto said the committee's goal is to have the statue completed before the spring, and no plans have been finalized for where the statue will be placed. Mayor Michael Pavia said he would like to see the statue placed in Veterans Memorial Park in downtown Stamford. Tony Pavia said he would be happy no matter where the statue is placed, as long as it is put in a public place where a lot of people could read about Wise. "I think the statue should be placed in a spot where many people would walk by and read about what Wise accomplished," he said. "I think that every child in Stamford should know who Homer L. Wise was and what he achieved." Vlasto said the committee has received 80 contributions from residents in Stamford and surrounding communities, totaling $39,897. However, the committee still needs to raise $70,000 to complete the project, he said. To learn more about the Homer Wise L. Memorial Committee and its efforts, visit www.sgthomerlwisememorial.org or send an e-mail to H.L.Wisememorial@gmail.com. Our mission is to raise public awareness and funds to erect a Bronze statue of Sgt. Wise in his adopted hometown of Stamford, Connecticut. Sgt. Wise received the Medal of Honor while serving as a Staff Sergeant, Company L, 142d Infantry Regiment, 36th Infantry Division for conspicuous gallantry and intrepidity at risk of life above and beyond the call of duty in action involving actual conflict with the enemy. Master Sgt. Homer L. Wise also received the Silver Star, Bronze Star, three Purple Hearts, and eleven other decorations. One of the most decorated infantrymen of World War II, Sgt. Wise, originally from Baton Rouge, Louisiana, wound up spending the second half of his life in Stamford, Connecticut. He died there in 1974 at the age of 57. Our country's history was paved with many great war heroes that have gone unrecognized. A statue of this humble man is a tribute to all soldiers: past, present, and future. Check out Medal of Honor News! The Homer L. Wise Memorial Committee, Inc is a 501 (c) (3), tax exempt public charity. Contributions on behalf of the Homer L. Wise Memorial Committee, Inc and are tax deductible under section 170 of the Internal Revenue Code. Copyright 2011 The Homer L. Wise Memorial Committee, Inc.